Flexographic plates, like letterpress plates, are relief plates with image elements raised above open areas. They are elastomeric in nature in contrast with hard letterpress plates. They are used in rotary presses and with low viscosity inks. Flexographic plates have a Shore A durometer hardness of 25-55 versus durometer readings in excess of 60 for letterpress plates. The process was originally called aniline printing because of the aniline dye inks that were first used in the process. Coarse surfaces such as corrugated board and stretchy films can economically be printed only with this process. Flexography leaped into prominence with the introduction of cellophane as a packaging material. 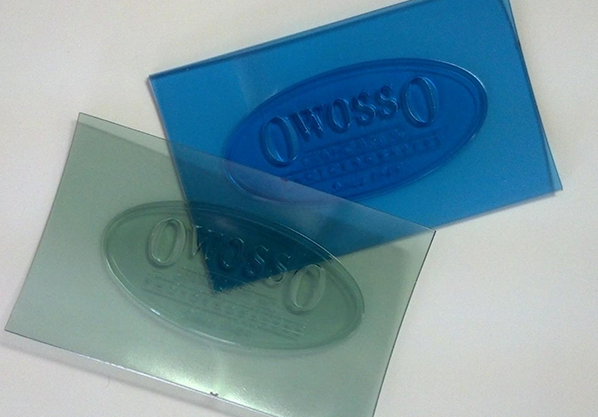 OWOSSO currently offers Flexo Plates in thicknesses of .045, .067 & .107.